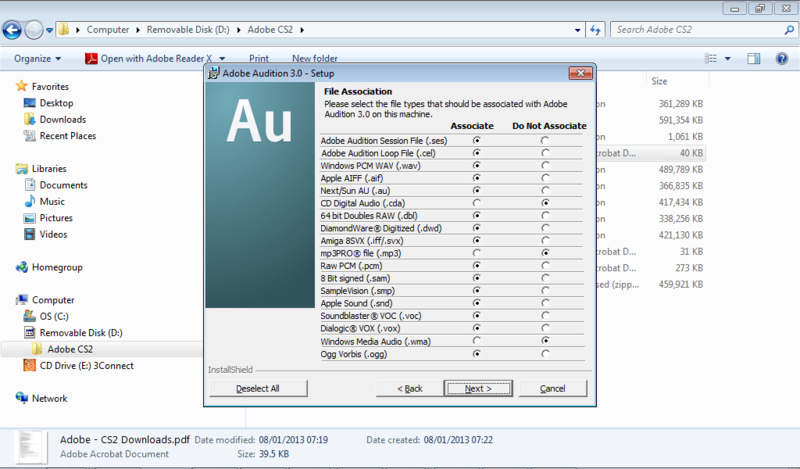 There is much talk on-line over recent days of how Adobe have released Creative Suite 2 for free, which includes Adobe Audition 3, audio editing software widely used in the radio field. or rather “My interpretation of the licence agreement is that you have granted me a licence free of charge for limited use”, not that I’m free to use the software anywhere without restriction, do read on for my findings. 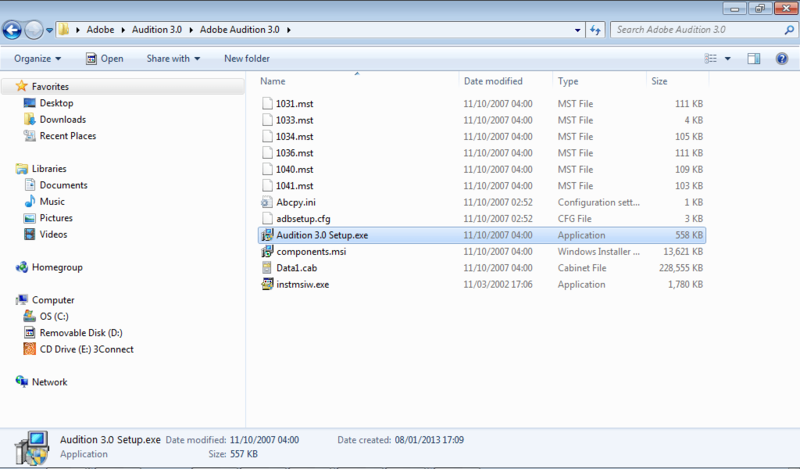 for pointers where I found the “offer” of a free copy of CS3. Never believe everything to read on the internet? Is it too good to be true? Disclaimer I am most definitely NOT A LAWYER, I do not have any (formal) qualification in law, but in my capacity over the years as a director of several companies and with responsibility over IT at a number of both “commercial” and “non profits” I’m no stranger to sifting through complex legalise. So in this article I’m going to run through my experiences of obtaining and installing this software, and my interpretation of the legal ramifications. 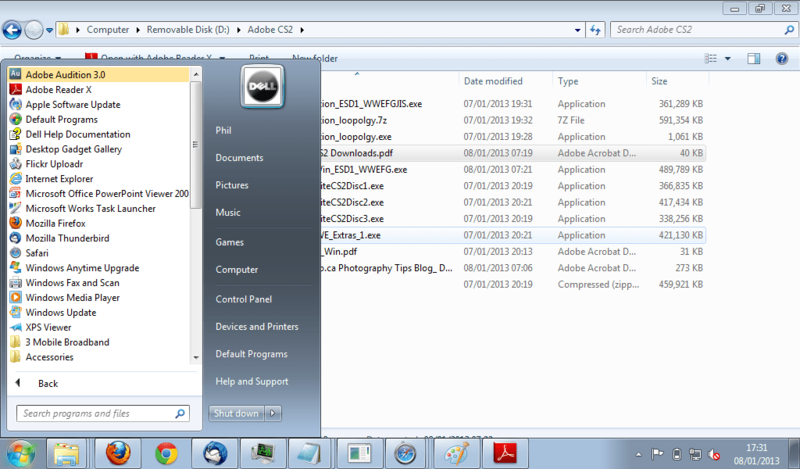 I signed into the Adobe account, that I created sometime in the past. All that Adobe seemed to have by way of details on this account is my name and e-mail address (though as it is a e-mail at a domain I own some rudimentary research would pull up further contact details.) I can’t recall why I signed up for an adobe account, only due to the fact I have a system to create unique passwords for different sites, that I was able to work out what I’d used as username and password for Abode. 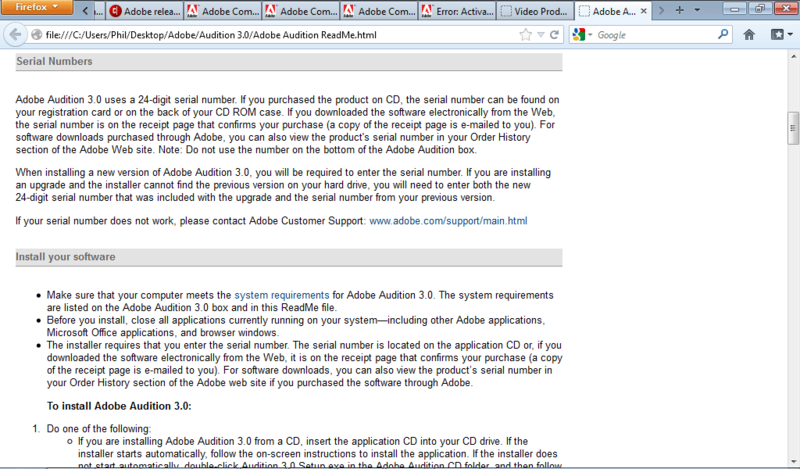 The page I visited provided me with download links on Adobe servers, and serial codes for the software. 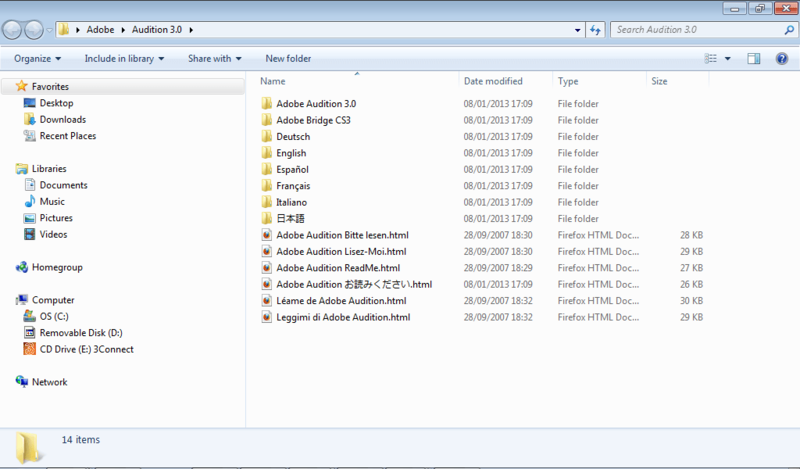 I duly downloaded some of this software, including the Adobe Audition 3 installer. 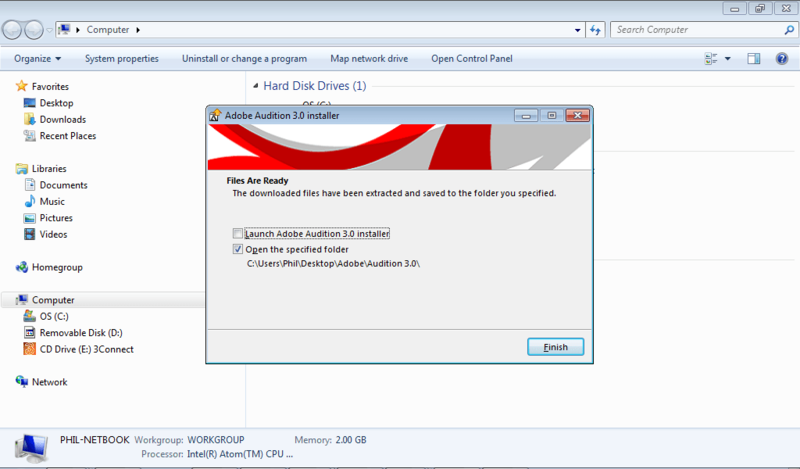 The downloaded file is a fancy ‘self extracting archive’ of the install files, which extract the files to a folder on your computer. 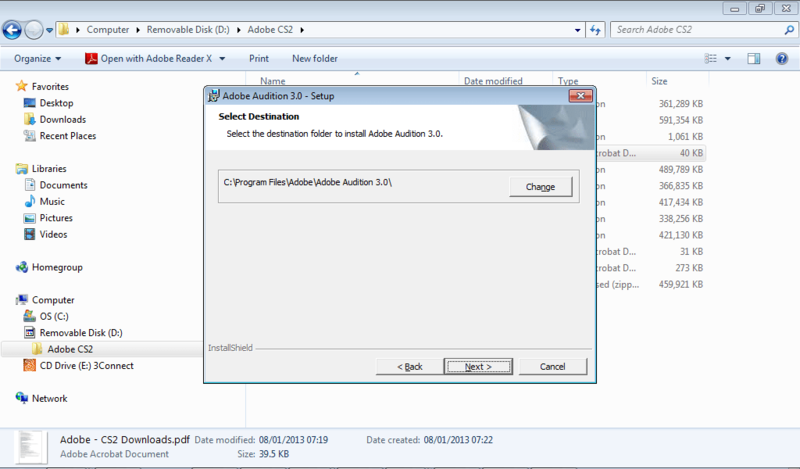 The ‘read me’ file talks of how I need a serial number (which I’ve been provided by Adobe on their website) and will need to ‘activate’ the software, which we know from the Adobe support article is no longer needed. 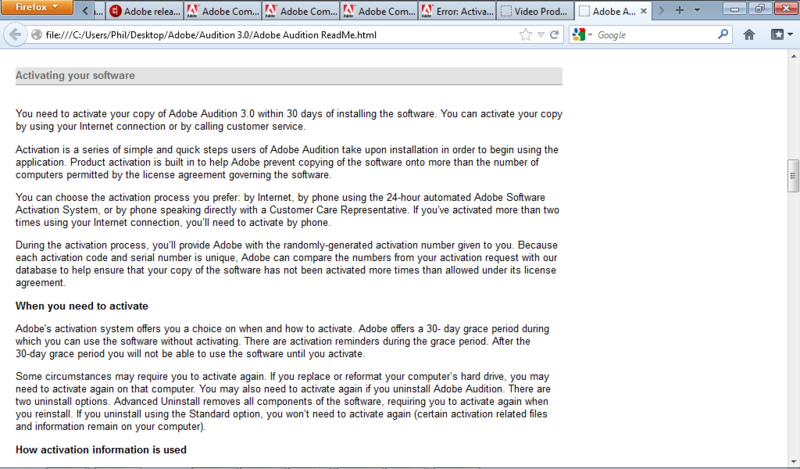 Indeed further along the process I was not asked to ‘activate’ the software. 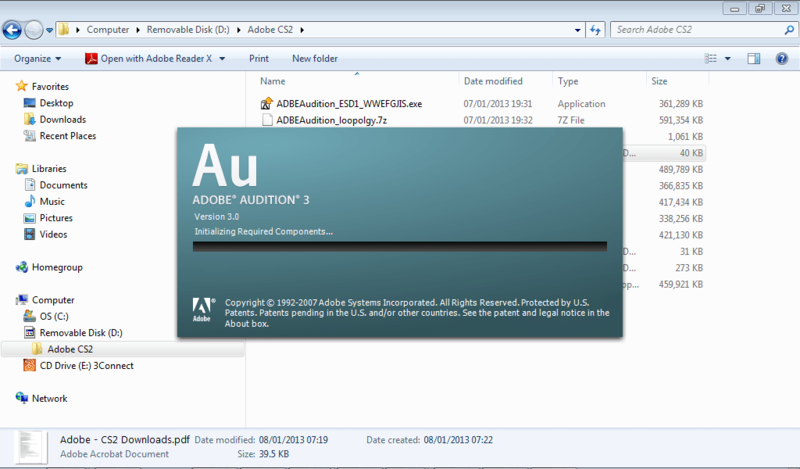 I run the “Audition 3.0 Setup.exe” file from the “Adobe Audition 3.0” folder of the files extracted. Just to make sure I right-clicked “run as Administrator” as I’m using Windows 7 so wanted to ensure the install went smoothly. I select the default ‘English’ language. I’m now asked to accept the Licence agreement. So I decided to read the contents of the EULA, I’ve uploaded a copy of the license document I was prompted to ‘save’ here. I take this to mean anything I read elsewhere, including statements from Adobe employees on their support forums, is irrelevant, the only basis that I can take to assume a right to use this software is as outlined in this licence document, apart from…..
Upgrades and updates may be licensed to you by Adobe with additional or different terms. I’m not planning on installing any upgrades or update, but if I do I will need to check if there are different licence terms. I have not been granted a different licence from Adobe, so in my case I must interpret “permitted number” to mean “one”. 2. 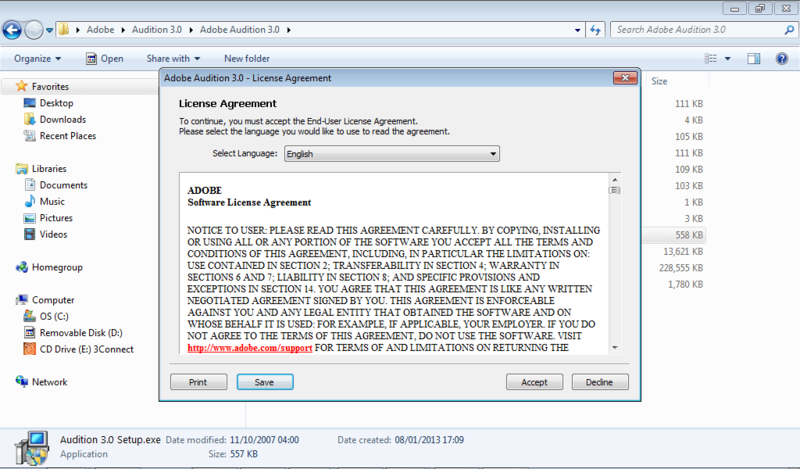 Software License. 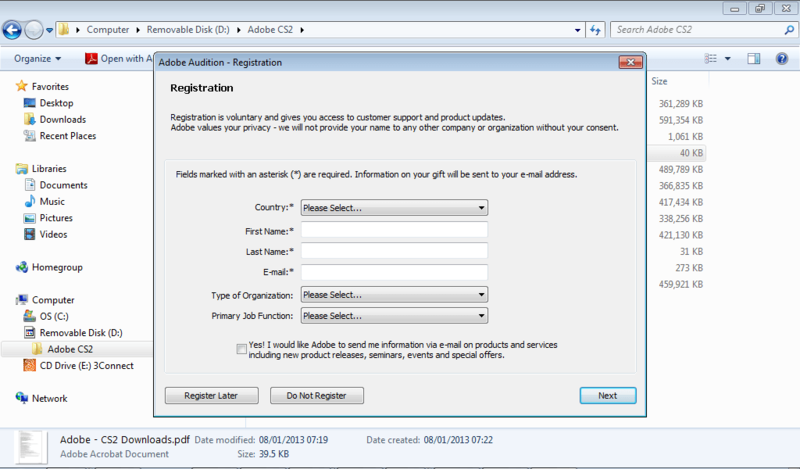 If you obtained the Software from Adobe or one of its authorized licensees and as long as you comply with the terms of this agreement, Adobe grants you a non-exclusive license to use the Software in the manner and for the purposes described in the Documentation, as further set forth below. 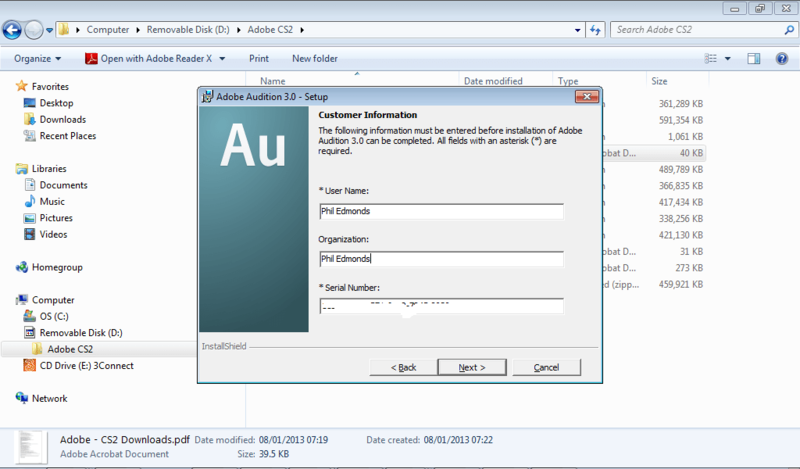 I have obtained the software from Adobe, as I downloaded the software from their site after following the link provided to be while logged into the ‘Adobe ID’ mechanism on their website, so they clearly knew they where providing the software to me. 2.5 Restrictions on Secondary Use by Volume Licensees. 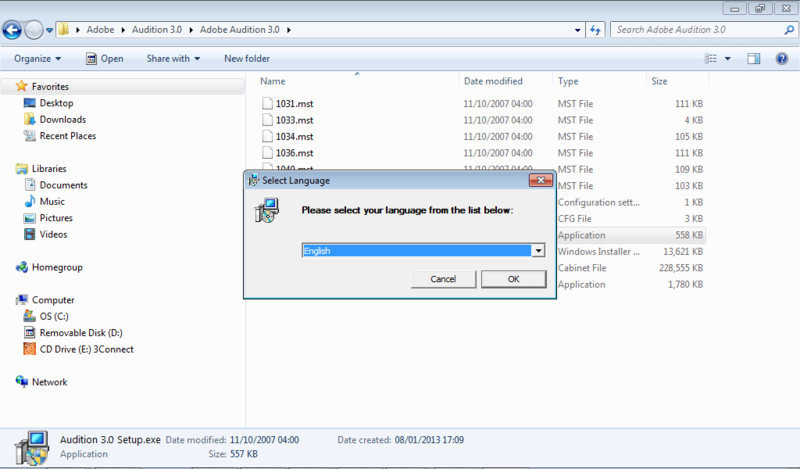 If the Software was obtained under an Adobe volume license program (currently known as Adobe Open Options) by any licensee other than an educational volume licensee, the second copy of the Software made under Section 2.4 must be used solely for the benefit and business of that volume licensee. I interpret this as meaning I can install the software on my “main computer” and also on a second computer in my home, or a portable computer, as long as I am not using it at the same time. I’ve not been issued a volume licence so the restrictions in section 2.5 are not applicable. If I had obtained this software on behalf of an organisation, be that a commercial business or a “non profit” organisation, rather than myself, this only lets me install the software on two machines, as long as both are not used at the same time. 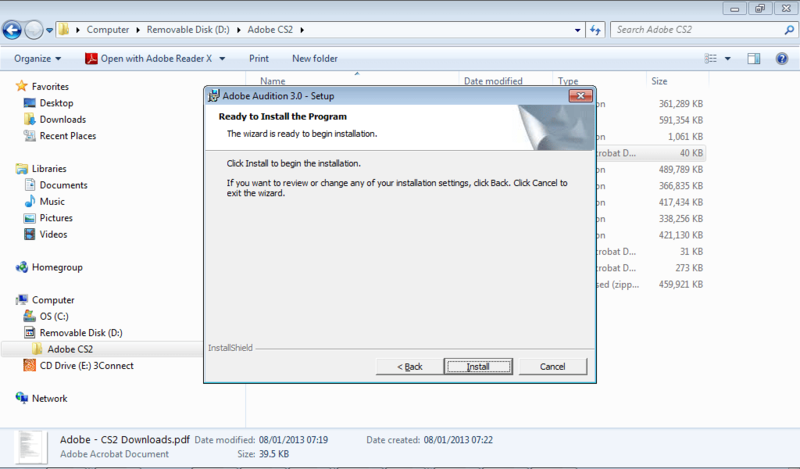 It does not allow me to install the software on more than two machines in my organisation. This is the interesting bit, based on my location in England, UK, if I had “purchased” this software, this agreement would be subject to English Law. However I have not “purchased” the software in the sense that no monitory consideration has changed hands between myself and Adobe. In a legal sense I am unsure if I would be deemed to have “purchased” the software. Given I may not have “purchased” the software, therefore clause 10 may be void, insofar as being not relevant, then the rest of the agreement still stands. The only outcome I can see of this is that the agreement is not governed by English Law. 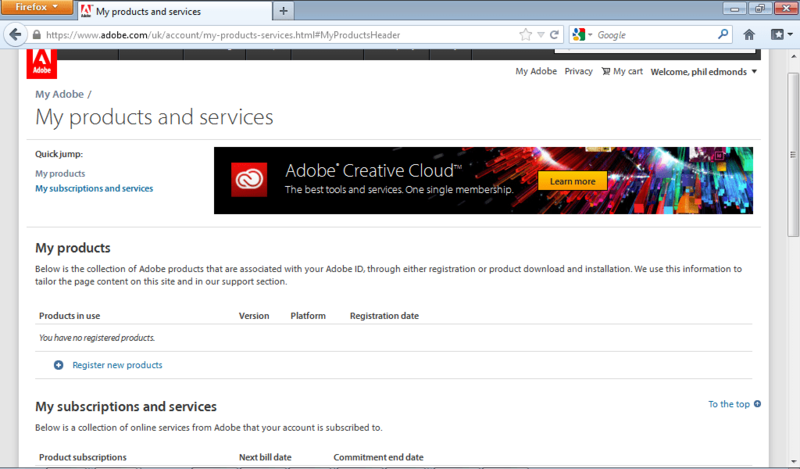 Does this mean that the agreement with me is governed by California law, as that is where Adobe are based? In this case as the end user I need to be happy that I am agreeing to the terms based on which ever jurisdiction I understand the agreement to be governed by. Although I am unclear as to what jurisdiction the agreement falls under, I’m happy to accept that I’m happy with the agreement regardless of what governing law it falls under, so I clicked the “accept” button to indicate my agreement. 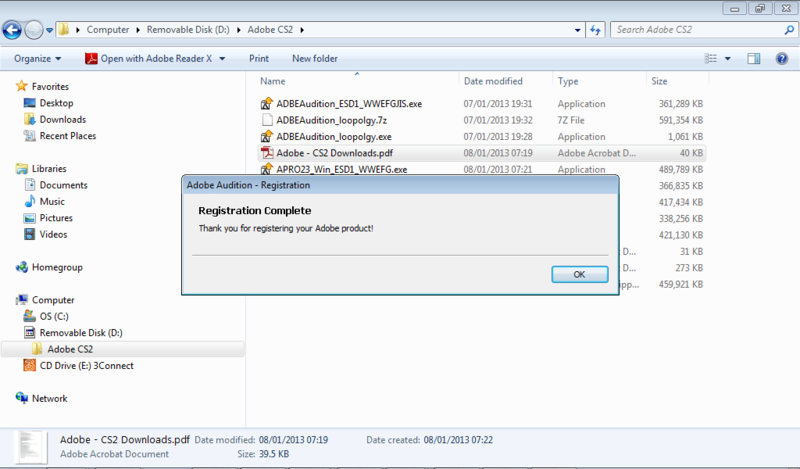 It prompts me to register the software, so I do using the name and e-mail address used for my Adobe ID. So I check back on the Adobe website, although I’ve registered the software using the same name and e-mail as used with my Adobe ID when I check it is not showing up in my Adobe ID ‘my account’ section. So what conclusions can I draw? 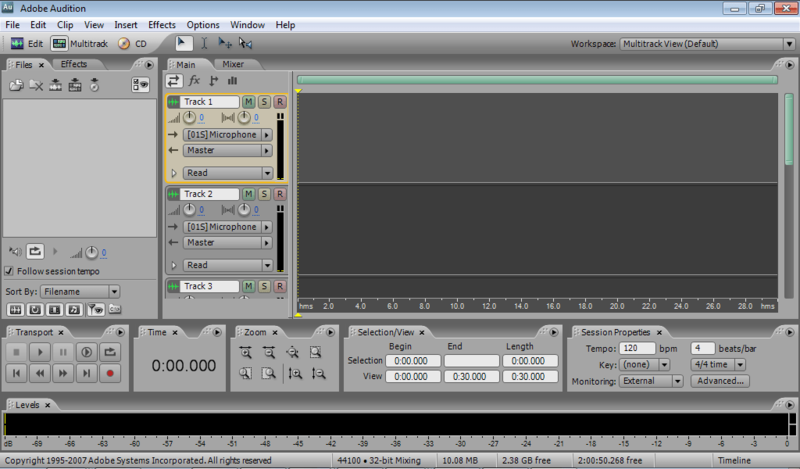 On a technical basis I’ve proved the software installs and works fine. 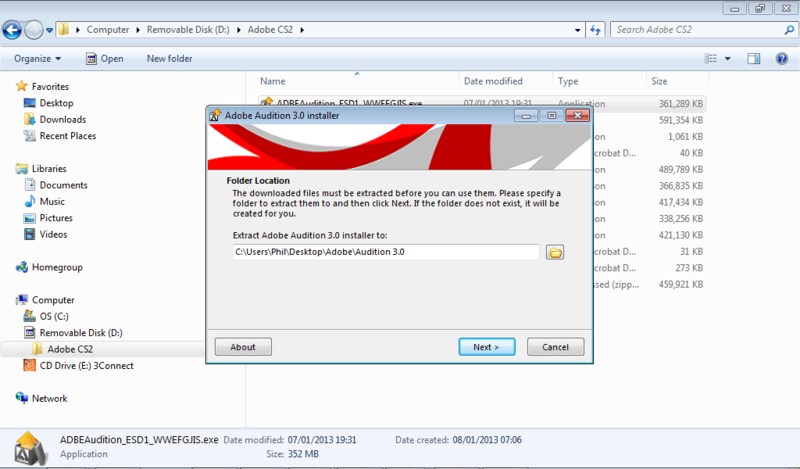 On a legal front I have satisfied myself as an individual user that I obtained both the installer and licence key from Adobe directly, while “logged into” their systems, so I’d argue they’d knew who they where providing the software to. I’m satisfied the EULA grants me usage of the software. My only doubt is that in the case of any legal action over the licence agreement I am unclear as to what jurisdiction the agreement would be governed under. However I am sufficiently satisfied that any action would come under the jurisdiction of either the courts of London, England, or California, US courts. While I’m not a lawyer I’m sufficiently happy that the my interpretation of the licence agreement Adobe have provided to me would be the same as any court. Furthermore the maximum “costs” they could seek from me is the value of the, to use their terms, of the obsolete software, which is not a significant sum. At this stage what I am NOT convinced of is the right to install this software on multiple computers in any of the “not for profit” organisations I work with. The licence clearly states the number of machines the licence allows the software to be installed on. 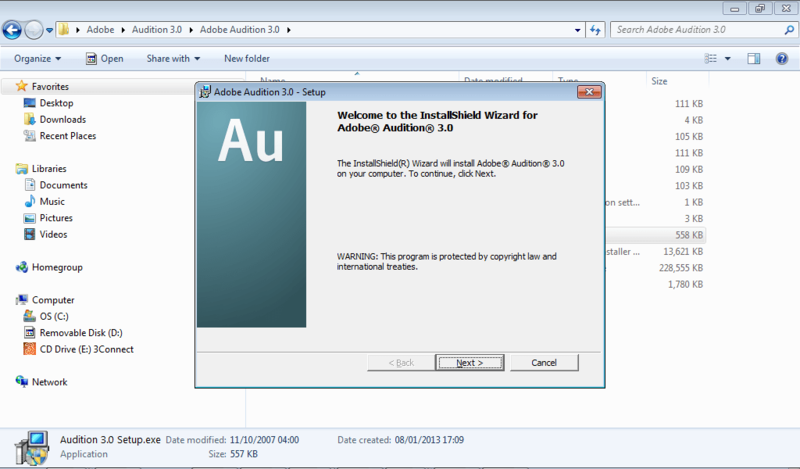 This is a bit of a shame, given in the past some the organisations I work with (community radio stations) have invested considerable sums, or at least what feels like considerable sums to them, in even older versions of Adobe software, it would be nice if they could legitimately “upgrade” to a more recent, if not current, version of the software. 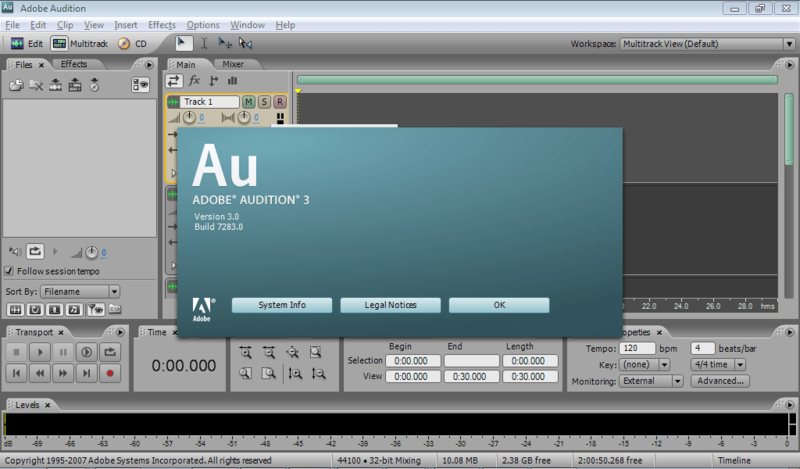 So at the end of the day, I’m happy I’ve got legit personal use of Adobe Audition 3, I’m not yet convinced I can roll out this version of Adobe Audition anywhere I feel like. Followed by a ‘I Agree’ button to press, then I get presented with the list of downloads and keys. This now makes it pretty clear what Adobe’s intentions are. This is the entire agreement between Adobe and you relating to the Software and it supersedes any prior representations, discussions, undertakings, communications or advertising relating to the Software. makes the warning on the download page irrelevant. But make you own mind up on the strength of that one!